It is the first week of 2016, which means gyms, fitness studios and the streets are filled with new athletes. Last night, my Pure Barre class was absolutely packed. And I loved it. Yes, I said it. I love all the new folks. I love seeing the streets crowded with people running. I love having to get to my favorite Pure Barre class early because it is packed out. I love it all. I didn’t use to feel this way. I used to hate on the gym newbie just like everyone else. But my perspective has changed and so should yours if you are still a gym newbie hater. 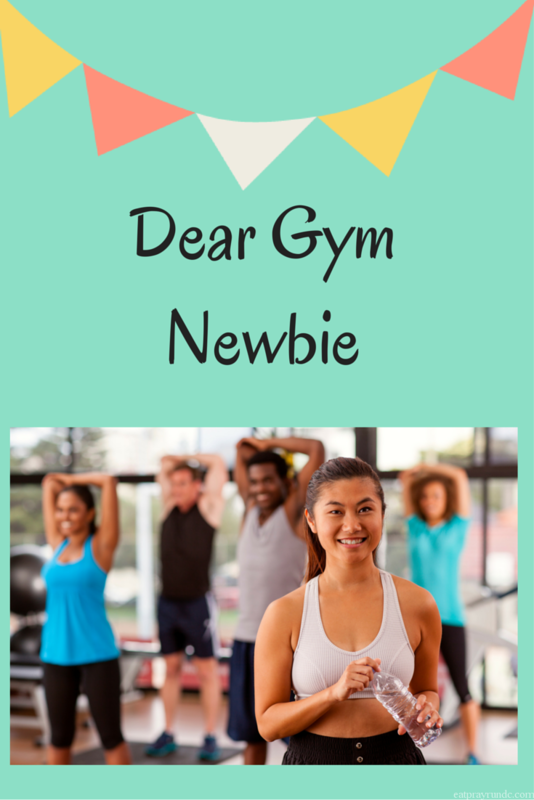 Read on for my letter to the gym newbie. First of all, welcome. You’ve decided to do something new for yourself and that is awesome! January is a great time to start getting healthy. It takes a lot of heart to start something new, so kudos to you! Set some goals. Like most new things, you might find that it’s tough for you to get used to the gym / Pure Barre / running / etc. Set some goals for this month. If you’re looking for some help in that area, check out my goal setting for 2016 post here and join in! Don’t go it alone! Bring a friend with you – it’s much easier that way and less intimidating if you have a buddy. If you can’t bring a friend, then make a friend. Despite all our gripping, us regulars are really nice and we’re happy you are here. I personally, love meeting new runners or Pure Barre folks. Basically just by saying “I’m new,” I’ll do anything I can to help you. If you are new to a studio (like, say, Pure Barre), show up a bit early. Not just for your first class but for each class. I find that I often spend the few minutes before class chatting with other folks who are also there early. That’s how community is built and developing relationships with others at your gym or studio will do a lot to keep you coming back! Those of us who have been at it for awhile sometimes forget how it felt to be the new one, so please be patient with us if we seem irritated at our fuller than normal classes. We forget how confusing that first Pure Barre class can be, but trust me, we too wondered “what the heck have I gotten myself into” more than once! So, settle in, enjoy and we sure hope you’ll stick around for awhile. You’re worth it. What would you tell a gym newbie? In the spirit of helping new (or veteran) runners, I’m excited to announce I’m a Zooma race ambassador this year! AND that means y’all can benefit – use my code COURTNEY16 and save 10% off of ANY Zooma race! I love this race series and am so excited to partner with them. Feel free to share the code with your friends and family! 100% with you on this one– I am SO happy to see all these people who have decided to prioritize their health. Great tips- for the newbies and the … oldbies? Some patience and effort on both sides goes a long way! Right? I hate when people are discouraging for folks that are just getting started! I hate all the FB posts and memes bashing busy gyms and new people. Be happy they are there trying to do something positive. This will absolutely come in handy! Gotta start my gym routine once again after 3 long years of being idle. Too true, I need to learn a bit more patience and remember I was there once. Its actually a nice reminder of how far you have come! Great post and it’s nice to hear you are so welcoming Courtney. My best advice to newbies (showing up early to class every time is great!) is to stick with it. After the newness wears off, it will get HARD. Embrace the hard and beat the statistics that say you won’t be here in March. GO GO GO! I always find it so encouraging to find the gym packed in January. Yes, it can be initially frustrating that its harder to get onto your preferred equipment, but is so motivating to see so many people wanting to focus on getting active and healthy. I think it’s great that you are putting a positive spin on the newbie! It takes a lot of courage to step out of your comfort zone and into the gym or a class. I hope some of them stick with it! My tip for a gym newbie is don’t give up. Everything is hard at the beginning, but it gets easier and better. I use the general rule of give it 10 minutes. Once you get moving, you usually find your mojo. What a great perspective! Surprisingly, my gym on the Hill hasn’t been crowded (I go in the mornings though), but I know I have the tendency to feel irritated when it’s busier than normal, rather than mentally congratulating all the newbies for putting themselves out there and trying something new. Also, that’s awesome you’re a Zooma ambassador–I’m toying with signing up for the race in Annapolis in June! More people = more fun! It energizes the instructor and the vibe is better. What a refreshing perspective, Courtney! I feel like so much of what we hear is negative when it comes to the newbies but we all start somewhere, right? Congrats on becoming a Zooma ambassador! YAY! I’m so excited that you’re a ZOOMA Ambassador again! I hope to do another one of these, one day, so you just keep on sharing the love, okay? I think fear of being the “newbie” is what keeps me away from a lot of group classes, although I will say that I branched out in 2015 and got really comfortable with a spinning class and its instructor. I don’t usually feel like that in yoga classes, but maybe it’s because I’m not really new to yoga? Thanks for sharing this and I hope someone will welcome the new folks; my work fitness center is still as empty as ever – ha! Thanks for writing this! I hate seeing all the newbie bashing status updates. Another tip I have: on day one, write down why you’re doing this and what you want to get out of it. You’re never more motivated than day 1. When you feel like quitting, go back and read it! Great perspective! I’ve seen quite a few cranky-pants posts about more people at the gym, so this is refreshing. Love this! My tip would be to relax and have fun! Everyone has been new at one time or another. And reach out for help if you need it! This is such an important message this time of year! Even though I am not a fitness newbie any more, I still feel insecure walking into a new gym or studio when I feel like I’m the only one that doesn’t know the ropes. Totally agree with this!! Let’s encourage them instead of make fun of all the new people that will inevitably be gone in a few months! Congrats on being an ambassador! A friend of mine, Jaime, is also an ambassador from Baltimore so I am assuming you will get a chance to meet her. I will congratulate them on taking the first step since I know it can be intimidating. You make very good points here! We should welcome newbies, who are trying to make a healthy change in their lives, not be mad at them. I will practice this philosophy on my zumba class! thanks! There was one group fitness class that I tried out about 2 years ago, and no one was very welcoming or helpful. I’m a very introverted person but I did make an attempt to introduce myself and say hello, and still nothing. I did like the fitness aspect to the class, but I left after awhile and part of my reason was the atmosphere. I have had great experiences with other group fitness classes however, so it didn’t deter me. I think it would be great if everyone welcomed those that are new to the gym or fitness classes. Great post, thanks for sharing!